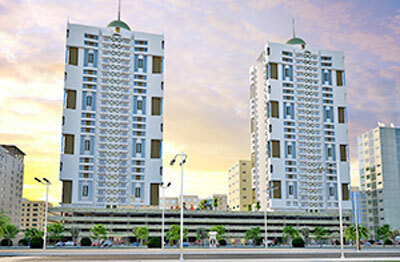 Bahrain-based Dadabhai group is set to launch a new residential project offering luxurious, spacious and affordable homes to both Bahrainis and expatriates with prices starting from BD50,000 ($129,467). The new project will target the housing requirements of the 'medium-end' segment, reported the Gulf Daily News, our sister publication. The company's managing director Shabeer Dadabhai said construction of the 28 and 29 storey Juffair Heights twin towers has already begun. "The freehold towers, expected to be completed by mid 2016, have been designed keeping in mind the requirements of this segment of population, particularly families," he stated. Project sales consultants Pegasus Real Estate managing director Aziz Mithaiwala said: "These apartments will be spacious one and two-bedroom units with the flexibility of combining and converting them into large three and four bedroom units with all modern amenities and facilities." "Juffair is an excellent and very safe location with several projects coming up in the area. This project is a complete and self-contained development for families, which will have all modern infrastructure in a friendly, safe and futuristic environment," he noted. "With the spacious sizes of the apartments, pricing has been kept extremely competitive based on the requirements of such segments of the population, which is looking for affordable family living," remarked Mithaiwala. He said a slab-wise payment structure for anyone buying into the development has also been designed keeping in mind his or her paying capacity. Mithaiwala said maintenance charges have been kept very attractive and competitive. "We are also offering a complete management service for the convenience of the buyers." He said bookings of the apartments would begin from the second week of this month and sample flats would be available to view by prospective buyers two weeks later. "We are very enthusiastic about this project since it is the first in Bahrain targeting a multiple segment of society."